Life in a Typewriter Shop: A Royal KMM With Some History! A Royal KMM With Some History! Two Pulitzer Prize winning books were typed on this 1946 KMM. This Remington 12 made in Toronto is in stunning condition. The modified return/index mechanism is interesting here. 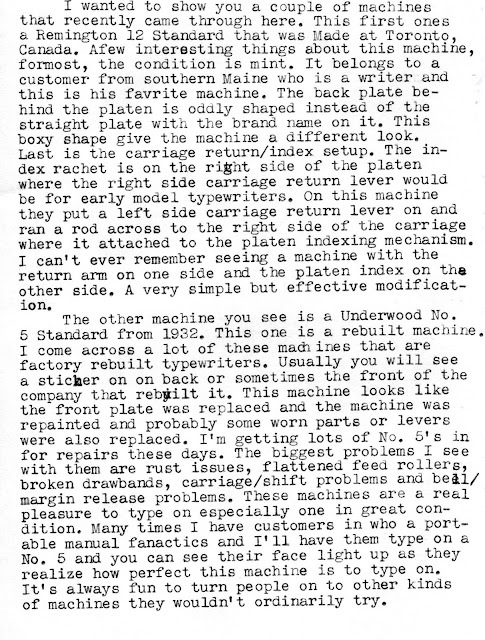 I see many of these factory rebuilt Underwood No. 5's. This Russian keyboard 1969 Underwood 21 just sold to a college in Alabama. 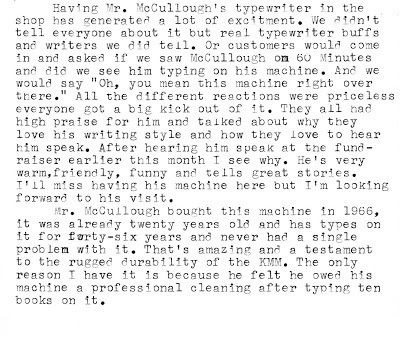 The first two pages were typed on Mr. McCullough's 1946 Royal KMM (yahooooo!). The third and fourth pages were typed on my favorite 1940 Remington Five (streamliner). Well, that's it for this week. Thanks for checking it out. Everyone have a great week. Wow, David McCullough, this is just great, Tom! You never know who'd step into your shop next. Love the KMM. Great post! It's fun to read about famous authors coming to your shop. The KMM is an impressive-looking typewriter, but the Remington and Underwood gleam beautifully. Reading positive things about specific brands and models always inspires me to use them again, if they happen to be in my collection such as the Underwood 5. I'm going to give it a spin today after a long absence, thanks to you! 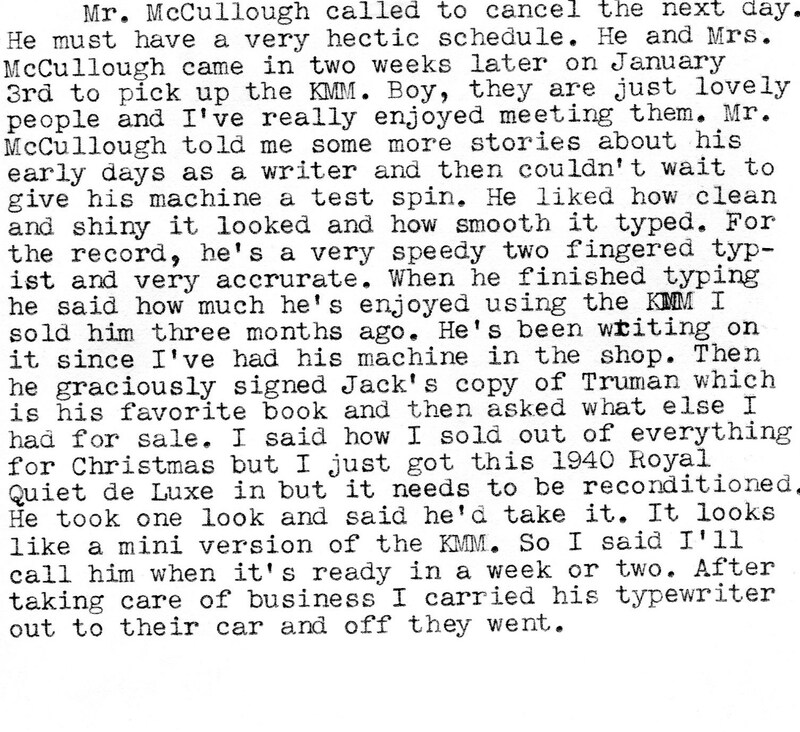 Mr. McCullough seems like a great person and I share his love of the KMM. I believe I got to see that Remington 12 when I was in your shop -- simply gorgeous! -- but I hadn't noticed the funny mechanical arrangement. Sounds like he picked up a twin my favorite machine, those early 40s Royal portables totally rock. 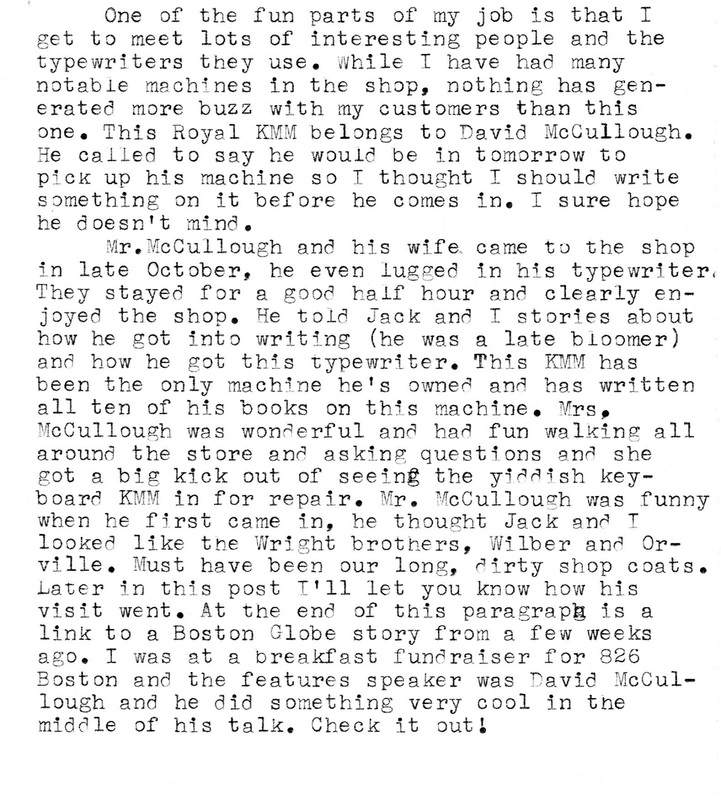 That is so great that someone as famous as Mr. McCullough stopped in your shop, and that he still uses a typewriter! I really like that Remington 12. I find it super interesting how all the really nice machines come across your bench. Better yet how you transform a grundgy machine into one that looks new. Ton- Thanks. I really do look forward to everyday at the shop because I never know what's going to happen. Cameron- Thank you. Glad you're going to dig out the No.5 and show it some love. Peter- The people who came in the shop and saw his machine up close really flipped out over it. Made their day. Richard- Thanks. That was the same Rem. 12 you saw on your visit. Funny, I hadn't notice the different index mechanism until three weeks ago when I worked on it. Mark- Thanks for your comments. I get a gazillion requests for the early 40's QDL. Wish I had a truck load of them. 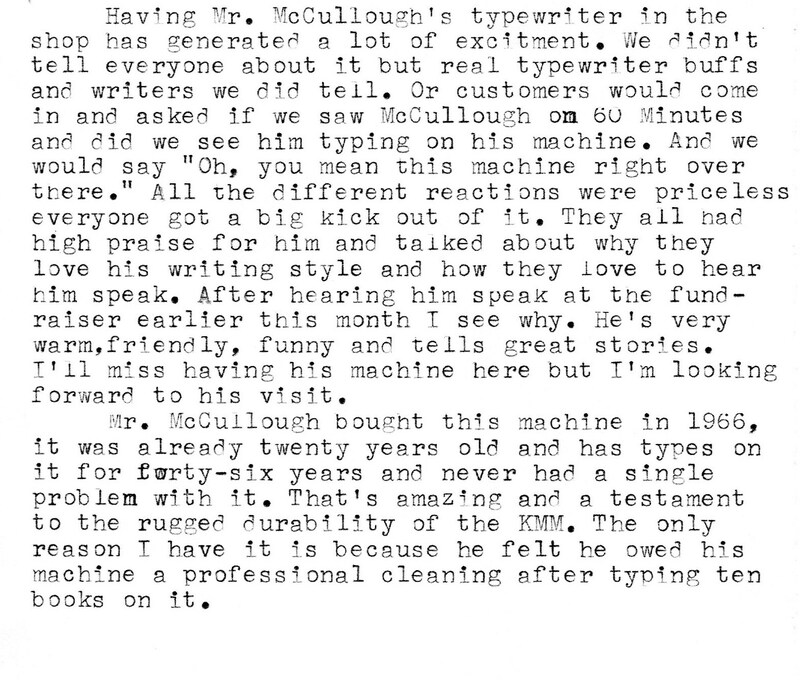 Bill M.- We do get tons of different kinds of typewriters in here. I still get excited when a machine comes in that I haven't seen before. That makes my day. Wow! Working on McCullough's KMM and getting to meet him! I got my own KMM after reading about his. It's from 1939, was serviced once in the 1950s (new key tops) and it works as good as the day it left the factory. It has become my most-used standard. Thanks for sharing this experience and for the link. How exciting to work on one of my favorite author's typewriter! Makes me wish I still had my old typewriter! I've really enjoyed reading your blog. 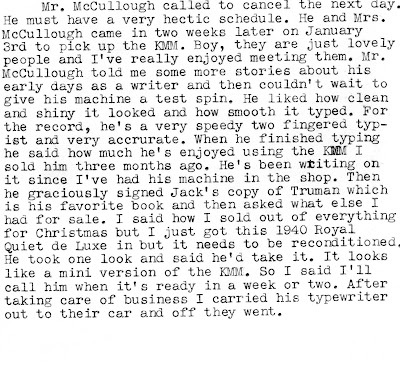 So much so that over the winter break I bought 16 typewriters. It started with a 1938 LC Smith Super Speed. You've inspired me to restart a bit of our family typewriter business. 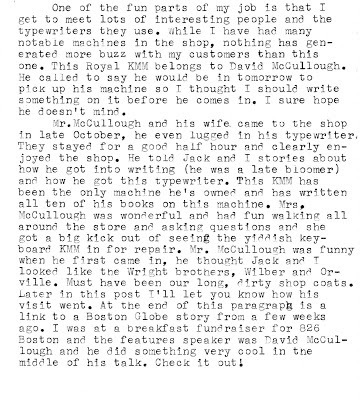 We were well known (I think) in the Houston area for about 75 years, until the typewriter era seemed to be ending, and I sold the family business to join the computer revolution. That was in 1982. I still have a day job running my computer business, but it feels right to set up a small shop restoring a few manual typewriters. We had the full Ames recommended shop setup back in the day, and were set up to do about 200 machines a month cuz we had a lot of school contracts, but I have to rethink the process for a tiny shop that just does a few portables. Also we did our cleanings with the idea the machine would come back in every few years. Now I have to think more about making a machine that is 50-75 years old last another 50 years. mostly Thumbs- Thanks for writing and commenting. I've received a few emails from people who left the business 25-30 years ago and have recently got back into typewriter repair part-time. That's great! I've had a number of customers from the Houston area lately and I'm sure it would be nice for them to have someone local again to go to. We have a Ames shop set-up too and it's still humming along. By all means, write back and let me know how things are going. Thanks again. I'm trying to find a replacement center button for the center of the left carriage knob on a 1947 Royal KMM. Any clues? I have a royal desktop serial kmm11-3059046, made in Canada, last patent stamped 1924; no 1 nor 0 keys and has couple of French accent keys. I'm having trouble finding manufacture date. My parents owned it. Any help would be appreciated. Thank you.